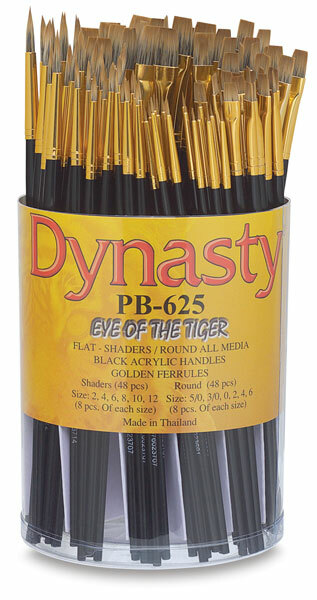 These handcrafted synthetic brushes have black acrylic handles and seamless gold-colored ferrules. They provide long-lasting performance at a value price. This canister contains 96 brushes, including 8 each of shader sizes 2, 4, 6, 8, 10, and 12, and 8 each of round sizes 5/0, 3/0, 0, 2, 4, and 6. 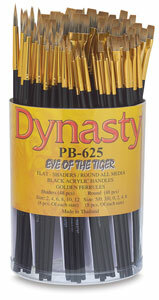 ® Dynasty is a registered trademark of FM Brushes.® Eye of the Tiger is a registered trademark.